Reporter Jesse Jones said he didn't expect the overwhelming response. 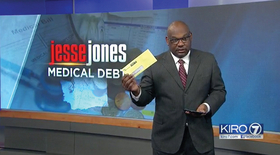 A Seattle TV station bought $1 million worth of medical debt that belonged to people in its viewing area, and the station doesn't intend to collect. KIRO-TV bought the debt of 1,000 people for only $12,000 after the station aired a story about a chronically ill woman who had put off a cancer screening because she couldn't afford it. According to KIRO's story, collection agencies will buy debt from providers for pennies on the dollar; a $1,000 bill could be sold for as a little as $10. But the amount owed could grow at 12% interest, allowing the debt to nearly double in six years. "I am a cancer survivor," Jesse Jones, the KIRO reporter, told Poynter. "I do well in my job, and I have been on payment plans to pay my medical bills. When you have $200,000 in medical bills, even with insurance, you are on the hook for some of that. I started thinking about my story and the stories of the people I see at the cancer center who I talk to every day." After the story aired, KIRO said viewers reached out to the station to find out how they could help. So the station has set up a page on its website to allow viewers to donate money to buy more medical debt to forgive. "My email is full," Jones said. "We never expected to get this kind of response."